The Jurassic Coast, a magnificent playground for big and small imaginations alike; where ‘Jurassic World’ really did exist (well, sort of!) and today we still find evidence of the life before us. Disappointingly, we don’t find many dinosaur fossils along the Jurassic Coast but we do find the traces they left behind, allowing us to walk in the footsteps of giants. The Purbeck Limestone Group, spectacularly exposed along the coast and in the quarries of Purbeck, formed between 145 and 140 million years ago as mixed layers of limestone and mud were laid down in lakes, lagoons and swamps. These habitats were often teeming with life, including dinosaurs. Do we find dinosaur skeletons in these rocks? …not so much. A few bones, but they are generally rare. We do find lots of dinosaur footprints however. So why footprints and no skeletons? it’s a bit of a mystery, but when you consider that any one dinosaur could leave thousands of footprints over the course of its life, but only one skeleton, it’s no wonder tracks are more common than fossilised bones. 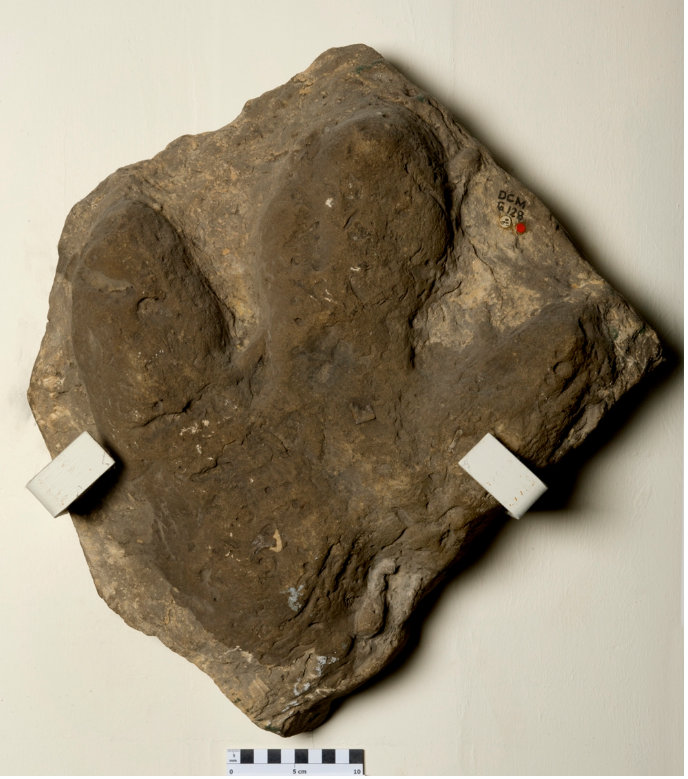 Dinosaur tracks, more often than not, are exposed in quarries, rather than at the coast. That is mainly because quarrying exposes large areas of the top surface of rock layers, where tracks are preserved. At the coast the cliffs cut down through the layers, making it less likely that the surfaces with preserved tracks will be exposed. The great thing is that Purbeck is dotted with small quarries, some run by the same families for over 500 years! With all that experience it should come as no surprise that it’s often the quarry workers that spot dinosaur tracks, rather than scientists. Many are rescued, preserved in museum collections, others are simply recorded and left to be quarried away. Not all are of scientific value. Several types of footprint are known. Probably the most common would have been made by dinosaurs similar to Iguanodon. Others belong to meat-eating theropod dinosaurs such as megalosaurs. 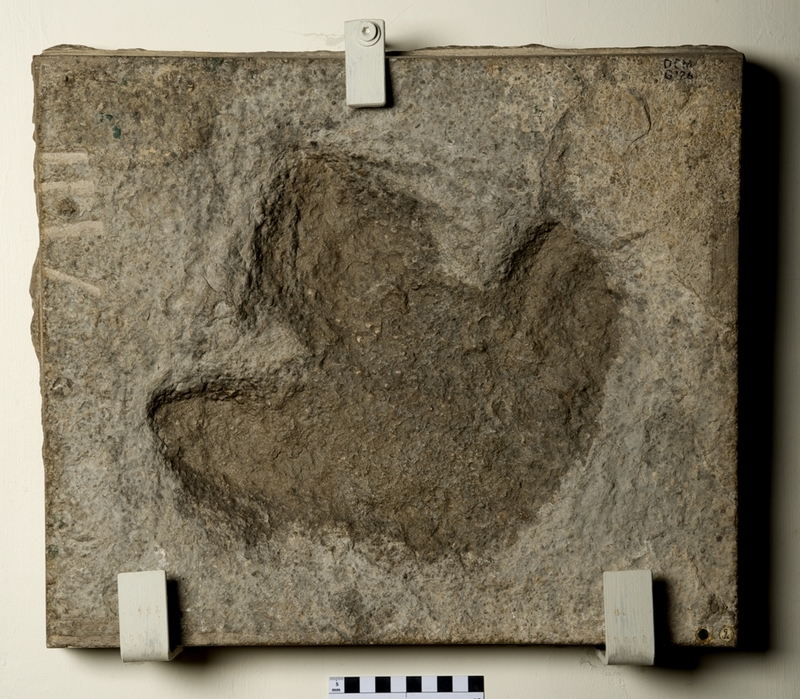 The rarest footprints identified so far were left by a pterosaur, walking along the muddy shores of a lake. These sorts of fossil track are mostly only visible in local museum galleries, having been lifted from the places they were found. 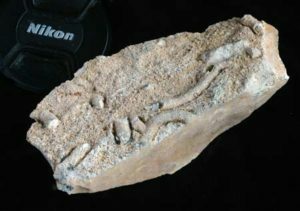 You can see some of these fossils on our fossil finder website. Understandably, working quarries are not open to the public. However, there is a site in Purbeck, just to the west of Langton Matravers, where the National Trust preserved dinosaur tracks in situ. They were discovered in the 1990s in a quarry operating on National Trust land. Across the exposed rock surface over 100 individual prints were found, each left by a sauropod dinosaur, probably something like a Brachiosaurus. While the quarry was still active the tracks were carefully covered to protect them. In the last few years the workings have moved elsewhere and the dinosaur track site has been opened up again. It offers a rare opportunity to see dinosaur tracks in their original position, in other words, they are right where the dinosaur left them. In truth these tracks are not of huge scientific importance, but that has been an advantage. If they were, we probably wouldn’t be able to let people in to walk across them, and there is no denying the magic feeling you get from standing in the footprint of a dinosaur, realising that all that separates you from the majestic animal that made it is 140 million years. You might be wondering how something as ephemeral as a dinosaur footprint is preserved. It is simply a matter of chance. This ‘trace’ fossil represents a moment in time when an animal walked across the wet sediment on the shores of a lagoon or lake. Then perhaps the shore dried out, baking the tracks into the mud. Maybe the next flood of water to wash across the shore brought fresh sediment to bury the tracks… and there they stayed, for millions of years. Until one frosty January morning, when a quarryman who, with the inherited and hard won skill of generations, exposed the footprints once more, to the sound of a diesel engine and the delicate scrape of an excavator bucket across limestone.